Space Shuttle Endeavour Mounted on 747 Jumbo Jet for Flight to L.A. The nose landing gear of space shuttle Endeavour is lifted during operations to raise the shuttle for securing to the Shuttle Carrier Aircraft (SCA) on Sept. 14, 2012. The shuttle is inside the Mate-Demate Device at the Shuttle Landing Facility at NASA's Kennedy Space Center in Florida. The carrier SCA will carry Endeavour to Los Angeles where it will be placed on public display. For the last time in space shuttle history, a NASA orbiter has been mounted to the top of a jumbo jet to be flown to its next destination. For shuttle Endeavour, now sitting piggybackatop the space agency's modified Boeing 747 Shuttle Carrier Aircraft (SCA), its next and final mission is to become a museum exhibit. The spacecraft, flying aboard the aircraft, will leave at sunrise on Monday (Sept. 17) from the Kennedy Space Center in Florida for Los Angeles, where it is destined for display at the California Science Center (CSC). "It is the youngest of our fleet, it's our baby," said Stephanie Stilson, NASA's flow director for orbiter transition and retirement, as she discussed Endeavour's soon departure. "We are letting go of our baby and turning her over to California." Endeavour was built in the wake of the loss of space shuttle Challenger in 1986. It flew 25 missions, many to support assembly of the International Space Station, before being retired in June 2011. 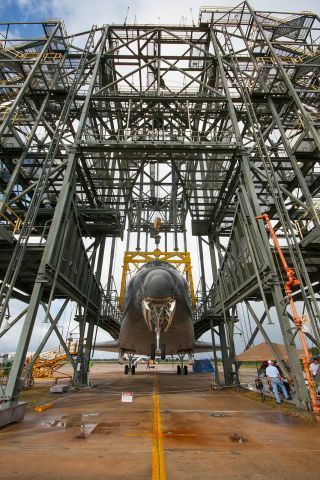 Space shuttle Endeavour is “soft mated” to the Shuttle Carrier Aircraft (SCA) inside the Mate-Demate Device at the Shuttle Landing Facility at NASA's Kennedy Space Center in Florida on Sept. 14, 2012. The operation is the last of its type for the space shuttle program era. "We are a little bit sad that this will be the last time that we're doing this," Stilson told reporters covering the mating operations. "There were definitely some tears this morning during the rollover from the Vehicle Assembly Building to the Mate-Demate Device, especially from those who have worked on Endeavour for a long period of time." Over the course of several hours, the 155,000-pound (70,000-kilogram) shuttle was attached to a metal sling and hoisted 90 feet into the air so that the carrier aircraft, known by its tail number as NASA 905, could be towed in underneath it. Endeavour was then lowered onto the back of the jetliner, such that three ports on its underbelly aligned with the attachment points protruding from the 747's upper fuselage. The two craft were "soft-mated" by mid-afternoon. On Saturday, technicians will work to "hard mate" the connection, securing bolts that will hold the two vehicles together in flight. The air- and space-craft combo will exit the MDD on Sunday morning in preparation for their final departure on Monday. The space shuttle era's final ferry flight will take Endeavour on a cross-country tour. In addition to performing low passes while flying over several NASA facilities, the carrier aircraft and its orbiter passenger will make planned stops in Houston and El Paso in Texas, and at Edwards Air Force Base in southern California before finally landing at Los Angeles International Airport (LAX) on Sept. 20. The journey, and its pre-departure preparations, are subject to both weather and operational constraints and could be delayed or changed, NASA officials advised. Once on the ground in Los Angeles and without a corresponding Mate-Demate Device at LAX, Endeavour will be hoisted off the SCA using two large cranes and positioned onto a modified NASA overland transporter. On Oct. 12, the shuttle will begin a two day road trip to the California Science Center, moving through the streets of Inglewood and L.A. on a 12-mile (19-kilometer) journey to its new home. The California Science Center will open the new Samuel Oschin Space Shuttle Endeavour Display Pavilion on Oct. 30.